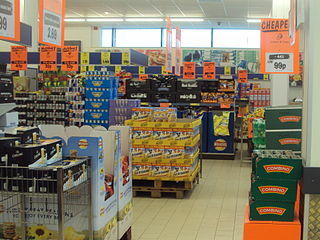 he interior of a Lidl store in Nottingham, England. Photo by Besijollen. German supermarket chain Lidl is entering the US market. With about 10,000 stores in 26 countries throughout Europe, Lidl is planning to add up to 150 stores along the East Coast of the US by 2018. The chain’s headquarters in the US is in Arlington, Virginia, and its warehouses are now being built in Cecil County, Maryland; Mebane, North Carolina; and Fredericksburg, Virginia. The company is starting to search for store managers in Burlington County, New Jersey; Richmond, Virginia; Charlotte and Raleigh, North Carolina; Greenville, South Carolina; and Augusta, Georgia. The appeal of Lidle is its low, low prices. It has been able to challenge the “big four” supermarkets in the UK with its bargain basement prices, achieved with less money spent on customer service, and savings on workers on the sales floor. The chain also does not supply shopping bags. Lidl also sells clothing, furniture and appliances. Lidl’s main rival is Aldi, which already has 1,300 stores in the US, with plans to add 600 more in the next few years. Aldi also originates in Germany, and together with Lidl has been giving stores in the UK a real run for their money. The two chains have sent the UK’s largest supermarket businesses into a devastating price war, while sending their market share into a downward spiral.